Lewandowski celebrating a goal for Bayern Munich. 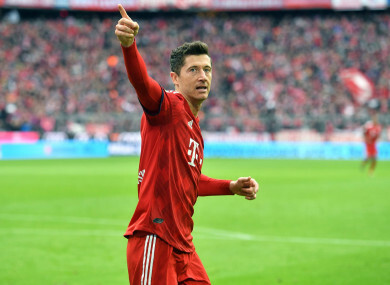 ROBERT LEWANDOWSKI BECAME the leading foreign goalscorer in Bundesliga history as Bayern Munich hammered Wolfsburg 6-0 to leapfrog Borussia Dortmund and move top of the table. Borussia Dortmund beat a struggling Stuttgart side 3-1 but Niko Kovac’s team collected their 12th win in 13 league games to ensure they became the new league leaders on goal difference. Bayern have never lost at home to Wolfsburg in the Bundesliga and first-half goals from Serge Gnabry – who signed a new contract this week – and Lewandowski set up a comfortable victory at the Allianz Arena on Saturday. After the break James Rodriguez, Thomas Muller and Joshua Kimmich added to the scoreline, with Lewandowski scoring his second, and Bayern got the perfect boost ahead of a Champions League second leg against Liverpool by moving above BVB despite their win. Lewandowski hit five goals in nine minutes off the bench against Wolfsburg in the 2015-16 season but he wasted an early chance by failing to control a lofted Muller pass. Yannick Gerhardt headed Maximilian Arnold’s corner over the crossbar, then Bayern took the lead in the 34th minute. Kimmich’s stepovers left Arnold dazzled and Muller pulled the ball back for Gnabry to nudge in from close range, the winger then creating a second goal within three minutes. A throughball from James found Gnabry and he unselfishly squared for Lewandowski to tap in and pass veteran former Bayern forward Claudio Pizarro on the list of foreign goalscorers. James scored the third himself in the 52nd minute, beating Koen Casteels with a placed 20-yard finish, the goalkeeper later making a fine save to tip over Muller’s drive. But the Bayern forward would not be denied again in the 76th minute, slotting home Franck Ribery’s pass to end a week that saw him dropped from the Germany squad on a high. And although Dortmund got back in front against Stuttgart, Kimmich and Lewandowski added late headers from Ribery centres to boost Bayern’s more impressive goal difference further. Bayern could not be doing more to put pressure on Dortmund, who had been top since their sixth game of the season. It might yet go right down to the wire but with Bayern now leading the table, few would bet against the champions winning what would be their seventh title in a row. Muller and Kimmich are suspended for Bayern’s last-16 second leg at home to Liverpool in the Champions League on Wednesday. Kovac’s men continue their title charge when Mainz visit the Allianz Arena four days later. Next for Wolfsburg is Fortuna Dusseldorf at home on Saturday. Borussia Dortmund’s five-month spell at the top of the Bundesliga is over despite a 3-1 victory over relegation-threatened Stuttgart at Signal Iduna Park. Lucien Favre’s side have been at the summit since late September but Bayern Munich’s 6-0 win over Wolfsburg sees them move above BVB on goal difference. Dortmund dominated for large parts of Saturday’s fixture and eventually took the lead when VAR helped award them a penalty for Gonzalo Castro’s foul on Jadon Sancho. Marco Reus converted from 12 yards, but they needed Paco Alcacer and Christian Pulisic to seal the three points after Marc-Oliver Kempf had levelled for Stuttgart. As the rain poured down in Dortmund, the hosts controlled proceedings but lost their composure in the final third with Sancho, Alcacer and Reus all guilty of wasting good openings. Sancho brought a fine save out of Ron-Robert Zieler just before the break, the England international’s low drive pushed around the post by Stuttgart’s goalkeeper. Dortmund continued to press after the restart but needed the assistance of technology to finally break the deadlock, Castro’s challenge on Sancho deemed to be inside the box by VAR despite initially being given as a free-kick on the edge. Reus made no mistake from the spot but a superb Castro free-kick was met by Kempf to restore parity, the defender left unmarked by the Dortmund defence. Alcacer saw a free-kick well saved by Zieler as Dortmund pushed for a second and it finally came with six minutes remaining, the Spaniard firing into the roof of the net. Pulisic added gloss to the result with a third in stoppage time, but it was not enough to keep BVB top of the pile. Email “Lewandowski reaches landmark feat in six-goal rout as Bayern leapfrog Dortmund to go top”. Feedback on “Lewandowski reaches landmark feat in six-goal rout as Bayern leapfrog Dortmund to go top”.